Comments: Mary Barclay Moon was born in January 1870 in Scottsville District, Albemarle County, Virginia; she was the daughter of James Nelson Moon (1836-1898) and Cary Ann (Coleman) Moon (1840-1920), who lived at Shirland, just outside Scottsville in Albemarle County. In the 1880 U.S. Federal Census of Albemarle County, VA, Mary was living with her parents in Scottsville, VA, where her father, James, was working as a merchant. On March 30, 1903, Mary married John A. Nicol (1856-1924) in Washington, D.C. In the 1910 U.S. Federal Census of Prince William County, VA, Mary and John Nicol were residing in Manassas, Virginia, where he was working as a real estate agent. 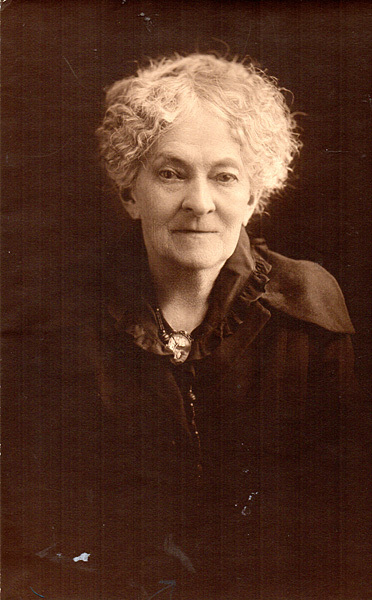 Mary and John were the parents of three children: Aylett Nicol, Cary Coleman Nicol, and Mary Aylett Barclay Nicol. 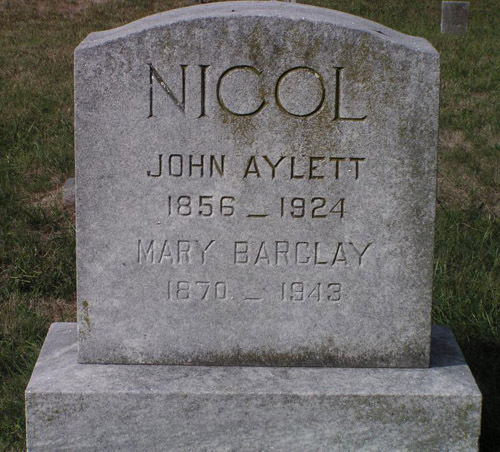 John Aylett Nicol passed away in 1924 in Manassas, and his wife, Mary Barclay (Moon) Nicol passed away on May 31, 1943, in Manassas. This photo of Mary Barclay (Moon) Nicol was provided courtesy of Cenie Re Sturm, Scottsville, VA.
Bottom Image of the Gravestone of John Aylett Nicol and Mary Barclay Nicol is provided courtesy of Find A Grave, Manassas Cemetery in Manassas, Virginia. 1. Sketches of The Moon and Barclay Families Including the Harris, Moorman, Johnson, Appling Families compiled by Anna Mary Moon, Chattanooga, Tennessee, November, 1938; p. 26. 3. John A Nichol and Mary B. Moon Nicol Gravestone in the U.S., Find A Grave Index, 1600s-Current; Manassas Cemetery, Manassas, VA., see: https://www.findagrave.com/memorial/21646038#view-photo=8239009 . 4. 1880 U.S. Federal Census, Scottsville, Albemarle, County, VA; Enumeration District 9, 01 June 1880, p. 4. 5. 1910 U.S. Federal Census, Prince William County, VA; Enumeration District 98, p. 6B.